This is part of the Cool Down With Agatha Christie summer extravaganza. 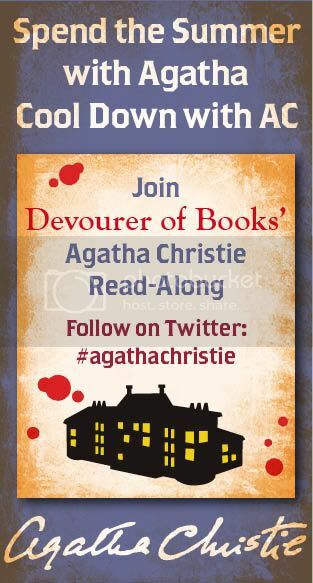 Three participants in today’s discussion will win a copy of next month’s readalong book, And Then There Were None, as well as an Agatha Christie mystery prize pack. Next month we will be reading And Then There Were None, if you would like to join us, please sign up on the Google form. Today we are discussing one of Agatha Christie’s later standalone works, Endless Night. Agatha Christie tends to use third person narration, the only exceptions I am aware of being The Murder of Roger Ackroyd and, of course, Endless Night. What did you think of her use of first person here? The way that this story advances is also very different from the way most of Agatha’s stories advance, with no dead body for quite some time. What were your thoughts while reading, did you find it suspenseful? With whom did you most identify while reading, Michael or Ellie? When the dead body finally did show up, what did you think was the ultimate cause of death? Did you suspect anyone? Endless Night ends with a big twist, did you see it coming? What did you think of the way Christie chose to end the story? Another Christie I haven’t read – thanks for the heads up! I actually didn’t think much of until later on where I was starting to get desperate for someone to die LOL I don’t think Mike made a very interesting narrator, but maybe it was meant to be a smokescreen for the twist at the end. I thought it was definitely creepy, definitely a mysterious atmosphere. I was focused more on the house and the gypsy curse kept waiting for something to happen there. Michael, I didn’t feel there was enough Ellie for me to identify with. I knew it was murder! But mostly because I was just desperate to have a murder already LOL I suspected Greta. No I didn’t see it coming, and I should have, because I’ve read a similar twist in another Agatha book. I actually had to re-read it again and thought, oh wow I was fooled again! At first I was shocked then I was a little let down, if that makes sense. Well, I’ve read that other novel with the similar twist, and I think she chose to tackle the twist from another angle. Agatha also does the whole partners in crime a lot (or perhaps the books I’ve read have that) I suppose it was interesting to do that in first person as opposed to third person. I was really put off by the use of first person here, because this is the ONLY Agatha Christie I’ve read that uses it. It just really threw me, because it is not what I’ve grown to expect from her, although I do think it made the final twist more dramatic. In Towards Zero it is over 100 pages until there is a dead body, but you know with certainty one is coming any minute, and part of the suspense is not knowing who it will be or when, let alone who the murderer is. In addition to the first person narrative, this drove me a little crazy in Endless Night, I felt I was never sure where anything was going, but not in a particularly suspenseful way. I don’t think this is my favorite of her books. I was convinced that Greta was behind it, like Book Purring was. I was also convinced that she had planned everything, up through marriage to Michael (even before Michael announced his plans to do the same) in order to get her hands on Ellie’s money. What I did not expect was the twist that Michael was in on it from the beginning. I thought we would end the book with him dead. I do think Christie did a very good job walking the line between the policing of Michael’s thoughts so it wasn’t too obvious without going too far in the other direction and making it quite implausible based on what we saw in his head. I really liked how Christie wrote that part of the book, too Jen. Although I didn’t completely trust Mike for much of the book, I didn’t think he was keeping anything major from us for most of it. Christie made him a very convincingly real if not that trustworthy a character. I agree with devourer… I really didn’t like the first person narration. I’ve read a lot of AC books, my parents having started me on a “collection” set when I was in high school (one of those book clubs where you get a book or two each month). Endless Night was in the collection but I had never read it until Monday. I also didn’t think much of Michael as a narrator. I found him difficult to follow (as a narrator) and as a character. I wanted to identify with Ellie but alas, like some of the other commentors, there was not enough of her in the novel for me to grasp onto. I was convinced it was Greta all along. For some reason, I thought Claudia might be in on at it at some point, espeically with her ending. I had that feeling Michael was bad, especially the way that Christie portrayed his own Mother’s feelings towards him. I finished the book late last night before bed and found myself unable to sleep as I kept going over and over it in my head…. I guess that’s why I love Christie. She always keeps me guessing and I must admit, I have never guessed correctly in the end of her books. Good book and I need to start And Then There Was None (also one of my favorites!!!). Thanks for a great blog!!! 1)First, I did not know the use of the first person was unusual for AC, so at first I didn’t think much about it. As early at chapter 2 and 3, the theme of memory comes up, so it only made sense, and fit perfectly with a first person narrator. When I reached the last 2 chapters and discovered what had happened, I think it made it even more creepy and sick to have it in the 1st person; I think a 3rd person narrator would have been more prone to induce some sense of guilt in the narration. I don’t feel any of that. It makes the character of Michael even more sick and evil. 2)I honestly did not need any dead body to find it suspenseful. From the first chapter on, you have words constantly recurring, such as shiver (a lot of shivering in this book, I can even count them for you if you wish! ), black cloud, shadow. moribund, semi-gloomy, scary, cold little wind. And actually the word dead comes up twice on chapter 4 (a dead and alive voice; it’s a death trap). Of course I felt a lot of suspense related to Gipsy’s Acre. I felt like a sword of Damocles was hanging over it (what better of suspense can you have than a hanging sword, ah ah!!). But I did not know when the sword would fall, and who was holding it, so plenty of suspense, yes! And when I thought I knew who held it (Mrs Lee in chap 5, and then Great in chap 11, because of her description as a Valkyrie – yes yes I fell twice in the trap myself! – I am really not too used to mysteries, apart from Ellis Peters’ s series on Brother Cadfael! ), I was absolutely wrong, and found even more suspense. Well Greta was in, but I had forgotten that Valkyries had partners. 3)Until chapter 23 I identified with Michael, just because of his social position. I don’t like too much very rich people. And the way the book is presented from the start is its memories of some very tough event that happened to him. So I really fell into the “oh poor guy…”. Though at the same time I was wondering why he absolutely insisted in getting this house – ok he did not seem to believe at all in curses, and then why he wanted to stay there, after all the real threats and signs. Again, never a minute did I suspect HE had planted them. 4)First I suspected Mrs Lee of course in chap 5, though it was so plainly presented that I should have known it could not have been her directly. All along the book, with similar threats and her disappearance the day of the 1st crime, I still thought maybe she was the culprit. And as I just said, I actually suspected Greta since chap 11, with the mention of the Valkyrie and the beginning of the them of the influence she has on Ellie. I did not like her personality at all, I thought she wanted to be nice to Ellie just to eventually kill her and get all her money. I never thought she was authentically helpful. And I sided with Mike and his fake hate of her, well he did hate her eventually, but in a more subtle way than I understood it earlier in the book. 5)I did not see anything coming… I could not understand why Greta in chap 21 said: I wish they would all go back where they belong. Those were the same words Mrs Lee had used earlier in the book, so I was totally confused: was Greta also a Gipsy, partnering with Mrs Lee to keep the house for themselves? The first shock came with the mention of the fake quarrel between Mike and Great in chap 23, and then it was non stop shock for 20 pages to the end! I think the way AC ends the story fits really well with the madness of Mike. It ends with this crazy monologue, all self-centered. It fits with the memory theme of the beginning of the book. I didn’t mind the use of the first person at all and liked to see that Agatha Christie could use this type of narration well, too. I also thought it brought us into closer, more intimate contact with Mike. As aresult, I didn’t totally trust him. He was a little too slick, too sure of himself and quite arrogant at times. I thought the use of the first-person also gave us hints that we might not have had with a third person narration. As much as Mike tried to hide things from us, I think he also let some things slip. He was too secretive and odd about his mother, for instance. And when Greta was finally part of the story, he was too anxious for us to believe he didn’t like her and that she wasn’t too be trusted. I thought this book was a fast read and I really enjoyed the way it was written. I like the British flavor and the English setting and some of the language and sayings so I never felt the book dragged. I expected at some point there’d be a dead body but I didn’t expect a murder to occur until Mike and Ellie moved into Kingston Bishop and the house Saxtonix built for them. I don’t think I really identified with Mike or Ellie but I like Ellie a lot. I wished she had someone around her who she could really rely on and trust besides Lippincott. More of a peer and friend. I didn’t trust Mike, I knew something was up with him and th same with Mike. I hoped Claudi Hardcastle might become a close friend but then there was the dead body…and another…. Imn chapter 15 Great complained about the gipsie woman threatening her. Ellie wondered to Mike if Great might be making it up and, instead of agreeing with her he asked why would Great make things up. It seemed very strange to me that when he had the chance to agree with Ellie about something negative regarding Greta he doesn’t. In the same chapter Mike went to the police about old Mrs. Lee, the gipsy lady. But when the police said Mrs. Lee had some money and maybe someone was paying her to scare Ellie, Mike was quick to disagree about this. That too was suspicious to me. Chapter 16 when Mike’s mother showed up was very strange, too. He was so angry with Ellie for visiting his mother and that seemed strange to me.. And once or twice in the book, Mike commented about how he had his house now and all the things in it and it was all his. It struck me as odd that he didn’t think about it has belonging to Ellie and him. So I was very suspicious of Mike! I thought the ending was great. Ellie was sweet and loving and trustful of Mike and I think that and what he did destroyed him at the end. I thought it was very clever to include how Mike didn’t even think about Great once she was gone. I also liked how Ellie’s song, the one she sane when playing her guitar throughout the book haunted mike in the end. I really liked ENDLESS NIGHT and I appreciated the first person voice because I was surprised by how well Ms. Christie pulled it off. I found Michael to be very believable. I admit I was a little frustrated by how late the murder occurred in this novel. Since I knew there would be a murder, I felt as if I was on the edge of my seat waiting. And then I was a little surprised by how quickly everything wrapped up. Of course, upon further reflection, I realize that it was an extremely effective way to tell this story. Not really sure I identified with either of them very much. I too thought it was Greta but then I kept thinking it was too obvious. I had a lot of other suspicions as well but none were as shocking as the real culprit. I actually thought the book left me with the heebie geebies! The shock plus the absolute cruelty was a little disturbing. I loved this one! It was my favorite Christie so far. I especially enjoyed the Gothic feel to this one.I thought the use of the first person was very smart. It threw me off that the narrator was the murderer. When I thought back on it the red flags that I missed lit up like his own mother’s reaction to him. It did find it very suspenseful. Once the first death occurred the body count racked up fast. I can’t say I really identified with either Ellie or Michael as I am not a rich heiress or a homicidal psychopath. When Ellie dies I first suspected the Gypsy woman but that was too obvious. I did not see the twist coming at all. After I finished the story however the clues throughout the story were very clear to me. This story reminded me of The Talented Mr. Ripley. This story was more interesting to me and much easier to follow than the last Christie I read, Three act Tragedy. I saw online that this one of Christie’s top 10 favorite novels and from my limited reading so far, I would have to agree. I do think the method of murder and motivation were much less convoluted in this story than in many of her stories. I agree with you and did not like her use of the first person voice. It sounded too artificial to me, like she was exaggerating the voice of a young man of the lower classes. At first when I started reading, I thought it was a woman who was talking once I got to the part where “Michael” was describing how Santonix and how he looked like. And I do feel as though she conveyed Michael Rogers’ disturbed psyche fairly well. This isn’t a psychological thriller in the sense of Ruth Rendell or Margaret Yorke; but it’s as close as Agatha Christie gets to one. Max Mallowan (Agatha Christie’s second husband) said he felt like this was her darkest novel. I think that’s a fair assessment. In the end, I found myself feeling fond of Endless Night, because like the other books Agatha wrote in the ’60s — Third Girl and Hallowe’en Party, to name two — you can see she really strives to strike a modern tone in both her characterization and plot details. I think she succeeds, and it’s surprising and pleasing. And to know that Agatha is revisiting a plot device she used forty years beforehand (with tremendous success) is interesting, too. NOTE: THE COMMENT BELOW CONTAINS SPOILERS. It was my 1st AGATHA CHRISTIE….. I truly am impressed with her way of writing…. but i could not understand the last part.. that is MIKE saw ELLIE then when he was going back home,was it because of his unstable state… and he even killed GRETA … n how did this indicate… “in my end is my beggining”? i would be grateful if anyone helps me to understand that….nad at last the twist in the story i could never suspect MIKE to be the culprit..and GRETA was such a cheat…..!! !